vegan slices at zpizza! plus a giveaway! vegan pizza day is just one week away, and zpizza is helping everyone get into the mood with vegan slices and a great giveaway! 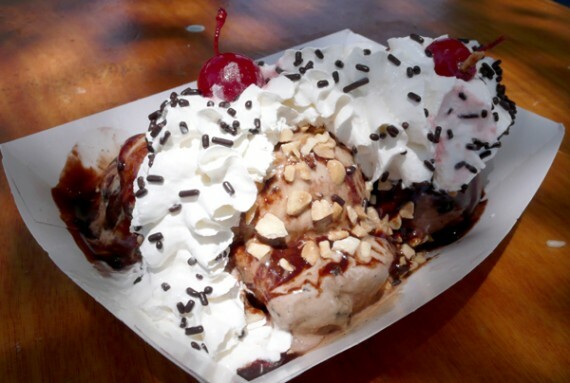 very vegan weekend: WORLDFEST, weenies, pizza slices & MORE! 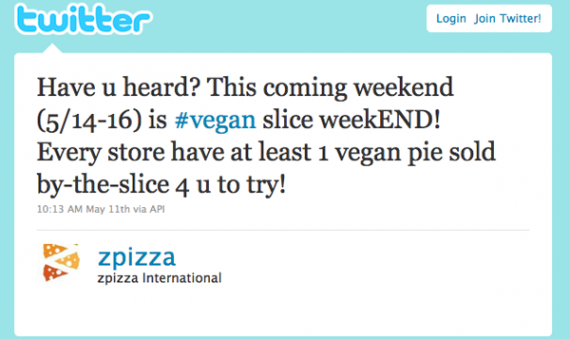 UPDATE: it appears that zpizza is not selling vegan pizza at every store, even though that’s how they advertised it on twitter. PLEASE CALL YOUR LOCAL STORE TO CHECK. 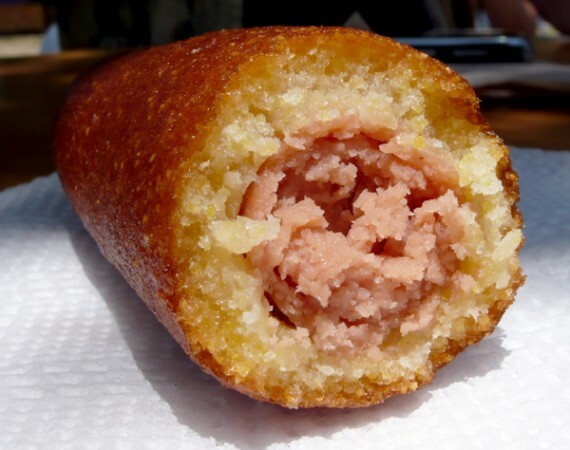 as of friday evening, both the weho and chatsworth locations were clueless about the promotion. however, santa clarita is totally legit. let’s hope they get this ironed out soon. we want slices! hey everyone, another weekend full of awesome vegan events is comin’ atcha! i’m gonna go a little bit out of order and say the one thing you ABSOLUTELY HAVE TO check out this weekend is worldfest which takes place on sunday may 16th from 10:30am to 7pm at woodley park. there is gonna be music, vegan food galore, bands, beer, and celebrity speakers. it costs $7 to get in for adults, $5 for seniors, and kids under 12 are free. for more info check out the worldfest website, and be sure to read my review from last year. one of the best pizzas i've ever had. i’m sure you’ve heard by now that zpizza, an awesome organic chain with locations all over the country, is offering vegan pizza with daiya cheese. they have a few locations in los angeles, and many throughout southern california. while most of the zpizzas in socal are already offering vegan cheese, every location across the united states should have daiya within the next couple months. if you haven’t stopped by and tried one of their vegan pies yet, well i don’t know what the hell you’re waiting for. i have been going to zpizza for ages, and until last night i always ordered the same thing: a build-your-own pizza with tomatoes, mushrooms and garlic. 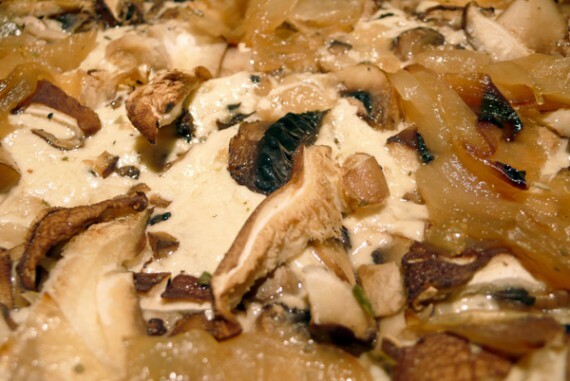 recently, on their facebook page, zpizza took the time to create a list of all their vegan-friendly pizzas and which substitutions need to be made to veganize them, as well as a list of which sauces and toppings are vegan. i was shocked by how many items off the “zpizza creations” menu were easily made vegan, and i was inspired to try something new. i went with the tuscan, which is easily veganized by omitting the feta and ordering it with daiya cheese instead of mozzarella. 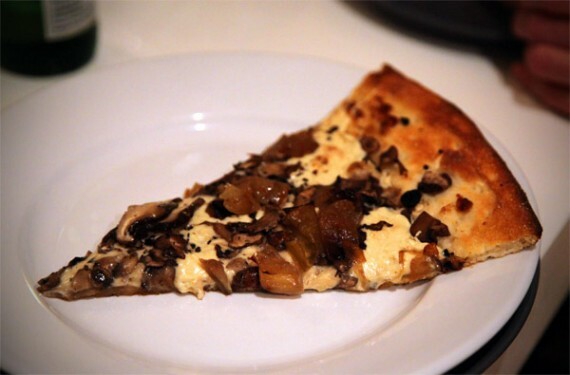 the vegan tuscan pizza came with a delicious mix of cremini, shiitake and button mushrooms as well as caramelized onions, truffle oil and thyme—all atop melty daiya cheese and homemade roasted garlic sauce. now i was already a huge fan of zpizza, and i can tell you this pizza blew my mind. i can’t believe a pizza chain could make something that tastes so unique and high-quality, and be VEGAN at the same time. i have heard people rave about the roasted garlic sauce, and they were absolutely right—no description could possibly do it justice. 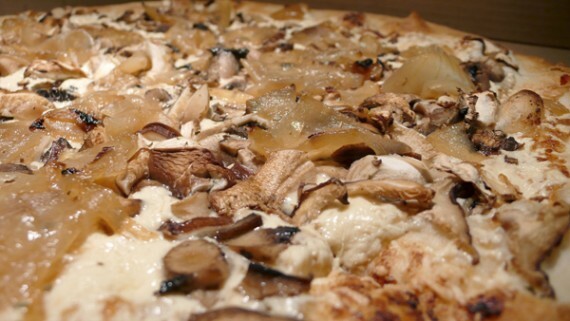 and the amazing sauce mixed in with truffle oil, sweet onions, and a variety of mushrooms was an absolutely heavenly combination. i cannot believe that i have been going to zpizza for so long and missing out on this bliss. another thing to note about this pizza is how perfectly distributed and melted the daiya was. they’ve gotten even better with the vegan cheese since my first vegan pie at zpizza a few weeks ago. with vegan cheese this good available, there is absolutely no excuse to be a vegetarian. really guys, i can’t speak highly enough of this thing. go to your nearest zpizza and get yourself a vegan tuscan pizza ASAP. oh and for a limited time, you can fill out this survey to $5 off your purchase at zpizza. i suggest you take advantage of this, as money off pizza is never a bad thing. 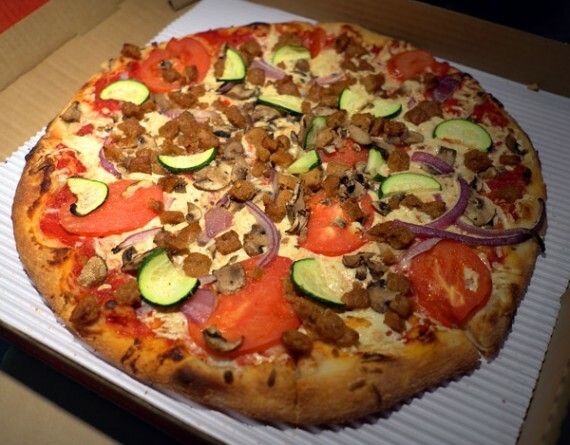 in los angeles, daiya vegan pizza is available at both the west hollywood, burbank and larcmont zpizza locations. if you are going to any of the other zpizzas, i would call and check to be sure they have vegan cheese. truly amazing vegan pizza from a national chain. oh my friends, i never thought i’d see the day. an important pizza announcement UPDATED! NEW UPDATE 07/25/09: ZPIZZA is replacing their non-vegan soy cheese with DAIYA VEGAN CHEESE! the NEW VEGAN CHEESE is AVAILABLE AT THE WEST HOLLYWOOD LOCATION. soon, it should be available at all zpizzas! this truly is a sad day because i have to recommend that my fellow vegans refrain from feeding their mock-mozzarella fix with zpizza soy cheese. i am sorry to announce that sources have confirmed the soy cheese at zpizza lacks total veganocity. i’ve gotten many mixed messages from both fellow vegans, and the corporate office of fransmart (the company behind the zpizza franchises) regarding the casein content of their soy cheese…to the point that i definitely don’t feel comfortable eating it! details to follow. and many thanks to scvegan for bringing this issue and new information to my attention. 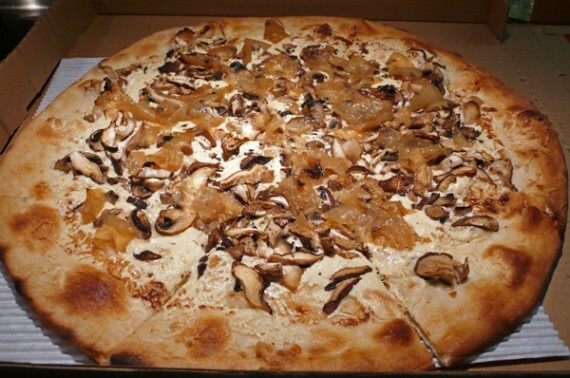 now, all you awesome vegans can resume eating at damiano’s. it is with great pleasure and relief that i can finally announce to the world, vegan zpizza in west hollywood is back! for 3 weeks there was a huge gaping hole in my life, when zpizza mysteriously stopped carrying their amazing soy cheese. this was seriously life-altering cheese that made it possible for me to be a vegan. i’ve never found anything like it, follow your heart came nowhere near. it melted almost like REAL cheese, and i’d grown addicted to it, needing zpizza once a week at the very least! that being said, you can imagine how my dreams were crushed one friday night when i called in an order after a peroni session at the formosa cafe only to find they were out of soy cheese! damn…surely it will be back tomorrow, i thought. but when i tried again the next day, still nothing—and it didn’t stop there! weeks passed as i called and called the restaurant and each time they assured me the cheese would be back soon. i was beginning to believe i would never taste this beautiful zpizza again.